Believe it or not, the first robotic vacuum cleaner was made by Electrolux, back in 1996. It was cool and cleaned quite well, but it had a lot of issues with navigation; in short, it was drunk! We came a long way since then, thanks to the rapid advance of movement and learning algorithms. In this article, we will compare two brands: bObsweep and Roomba. The article is set in a bObsweep vs Roomba fashion: we will compare anything from performance to price. Roomba 690 will represent the Roomba brand, and Bob PetHair will represent bobsweep. bObsweep vs Roomba – Who Wins? In a 1v1 matchup, Roomba 690 wins. It is Roomba’s value for money vacuum, one that would set it all up for future Roomba pet series. 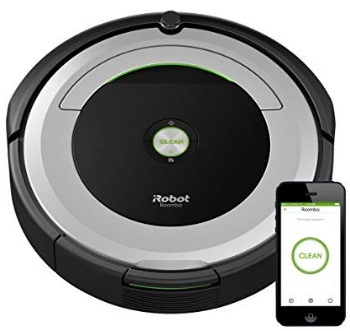 It doesn’t have the same advanced features some newer Roombas have, but it does connect to iRobot Home app and comes with one Virtual Wall. On the other hand, bObsweep PetHair vacuums, sweeps, and mops, while 690 only vacuums. It has a user-friendly LCD screen and comes with the controller, but it is less robust and less durable than the Roomba 690. The model we are reviewing, the Bob PetHair, is very affordable. It has a very generous, 1-liter dustbin, LCD screen, and a remote controller, which allows you to navigate the vacuum manually (which can be fun and useful). bOB PetHair is quieter than Roomba 690 and offers similar cleaning performance. However, it isn’t as efficient as Roomba, since Roomba does have a better navigation system. Great for cleaning pet hair. A bit bulky (3.9 inches high). Bob PetHair is an affordable and efficient bObsweep pet hair vacuum cleaner. It sweeps, vacuums and mops, though it isn’t that efficient at mopping. The 1-liter dustbin is very much welcomed, allowing Bob to vacuum a lot of debris. Roomba 690 is a bit more advanced than Bob since it does connect to your smartphone. In fact, you can control it via Aleksa or by using Google Assistant, which is very convenient. Then again, it comes without a remote controller, which most bObsweep vacuums feature. It isn’t the best Roomba for pet hair (that would be the Roomba 980, refer to Roomba comparison chart for more info), but it still offers excellent cleaning performance, especially on a carpet (like most Roombas do). It is a bit more expensive than Bob, but it is worth the cost. Good performance on the carpet. Good vacuum for pet owners. Navigates poorly in cluttered space. Roomba 690 is the classic among robot vacuums. It vacuums efficiently on all surfaces, it comes with one Virtual Wall and Dirt Detect sensors, and features the Auto-Adjust cleaning system, which allows it to transition from surface to surface automatically. Here, we will compare some of the most critical aspects of both of these vacuums, such as design, cleaning performance, ease of use, maintenance, and so forth. Let’s get down to business. The Bob PetHair (let’s call it Bob) is 13.8 x 13.8 x 3.9 inches big and weighs 7.7 pounds. Roomba weighs the same but is 13 x 13 x 3.6 inches big. Now, while the bigger size allows Bob to cover more space, it is harder for this vacuum to maneuver and navigates in tight spaces. Also, the added 0.3 inches can make a difference when it comes to vacuuming beneath low-profile furniture. Bob is a bit rounder than 690, which does allow it to rotate 360-degree fashion more freely. Bob also features larger dustbin, which is the main reason why it is bigger than 690. It also has the LCD screen at the top, which showcases data related to Bob’s condition (battery life, schedule, current mode etc.) Roomba 690 features much more simple design: it is smaller and features simple on/off button, as well as easy to use the CLEAN button on the top. Both vacuums feature protective bumpers at the front, which protects them from taking damage or causing damage to your objects. It is worth mentioning that 690’s smaller size allows it to maneuver more efficiently between tight spaces, but it struggles with navigation when those spaces are cluttered. Every bObsweep robotic vacuum uses central roller brush, side brushes and the suction system to clean. Like Roombas, it features one sweeping side brush, which helps them clean around corners and edges. Roombas feature dustbin-release, bomb sweeps don’t. Also, most Roombas (690 does) have edge sensors positioned on closer to the edge of the vacuums, while bObsweeps have them placed beneath the vacuum cleaner. Roomba 690 features Roomba’s traditional Three-Stage vacuuming system, which consists of agitation, rolling and suctioning. Roombas also feature Dirt Detect technology, which helps them located the dirt more efficiently. Moreover, these robots will remember the space they clean. Thus they will vacuum better as the time goes by (assuming you maintain them adequately). Interestingly, bObsweeps feature something called Blindfold Stickers, which are used for cleaning dark surfaces (such as floors, tiles, and carpets). Keep in mind that, once blindfolded, the vacuum won’t be able to use its sensors for stairs and edge detections. 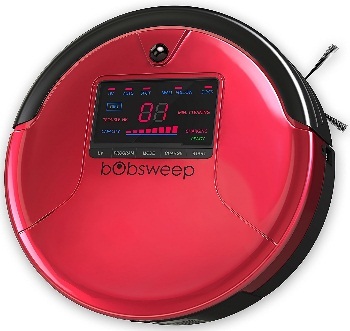 When it comes to cleaning hardwood floors, bOBsweep wins, but not by a lot. Roomba does clean rapidly, but less efficiently. However, when it comes to carpet cleaning (both low and high carpet), Roomba wins. This isn’t just true for these particular models, the Bob and the 690, but it is a general rule. By far the most efficient carpet cleaner is Roomba 980. When it comes to pet hair, 690 also wins, but not by a lot: both of these vacuums are excellent pet hair collectors. So, if you seek hardwood vacuum cleaner, you should probably go with Bob, otherwise, go with 690. I would say that bObsweep is a bit easier to use. Firstly, you have the LCD screen, which displays critical data. While it is nice to connect your Roomba to the HOME app, that does take some time to set up. bObsweep is also a much better option for technophobes, though I doubt the technophobes are interested in robotic vacuum cleaners. bObsweep also comes with the controller, with which you can navigate the vacuum manually if it gets stuck somewhere or if you want to clear some specific spot in your home. With Roomba, you don’t have that option. Both vacuums come with the spare parts, such as extra side brushes, HEPA filters, cleaning kit, etc. Roomba comes with Virtual Wall, bObsweep doesn’t. In essence, bObsweep may be cheaper to purchase, but is much more expensive to maintain, because the Roomba replacement parts (such as a battery, brush, wheels, and so forth, are less expensive). And when it comes to cleaning, both of these vacuums require a lot of attention, as do any other robotic vacuum cleaners. This includes emptying the dusting regularly and cleaning the rollers and side brushes. Still, bOBsweep does require a bit more attention, since it is less durable. Surface-wise, Roombas are better, especially on carpets. Roombas are also better with collecting large pile debris. Both Roomba and bOBsweep either excel or struggle with navigation, depending on the model. More advanced Roombas feature iAdapt 2.0, which is an upgrade to iAdapt. Newer bOBsweeps feature „Block” technology, which helps with navigation. I feel bOBsweep takes less setup time and is much simpler to use. Also, the LCD screen is quite helpful. BOBsweep vacuums are generally less noisy than Roombas.. In both cases, you get what you pay for; both vacuums are valuable for their purposes. In general, Roombas have a stronger battery, especially newer models. Roombas are generally more efficient when it comes to pet hair vacuuming. Well, it depends on your budget, as well as on the surfaces in your home. If your floors are covered with carpets, Roomba will always be a better option. Also, if your budget allows it, you should probably go with the Roomba vacuums. It’s just that Roomba has a lot more to offer, feature and performance-wise. It is more convenient, more durable and a bit more sophisticated than the bObsweep. But don’t think that bObsweep isn’t a valuable option, especially if you want to save some money. If you seek more in-detail information regarding specific Roomba or bObsweep vacuums, you should definitely read some bObsweep reviews, or refer to Roomba comparison reviews.